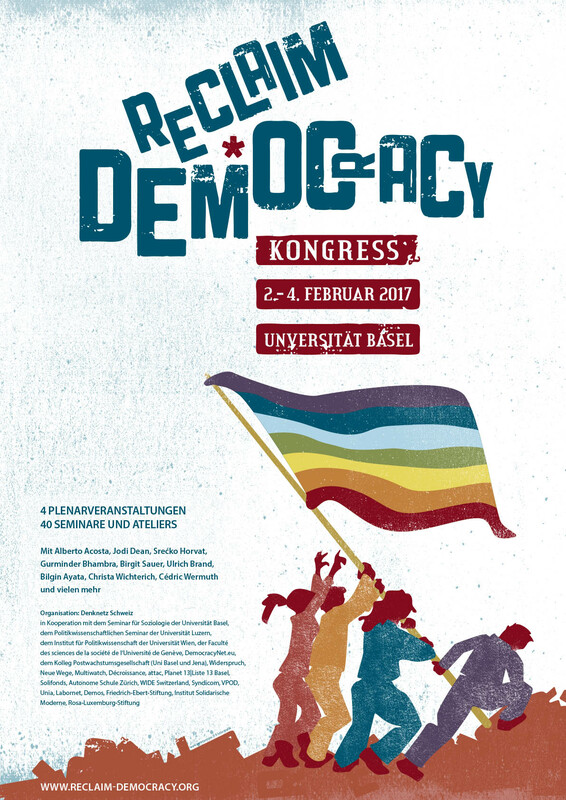 From February 2nd to 4th, 2017, the congress Reclaim Democracy will take place at the University of Basel. 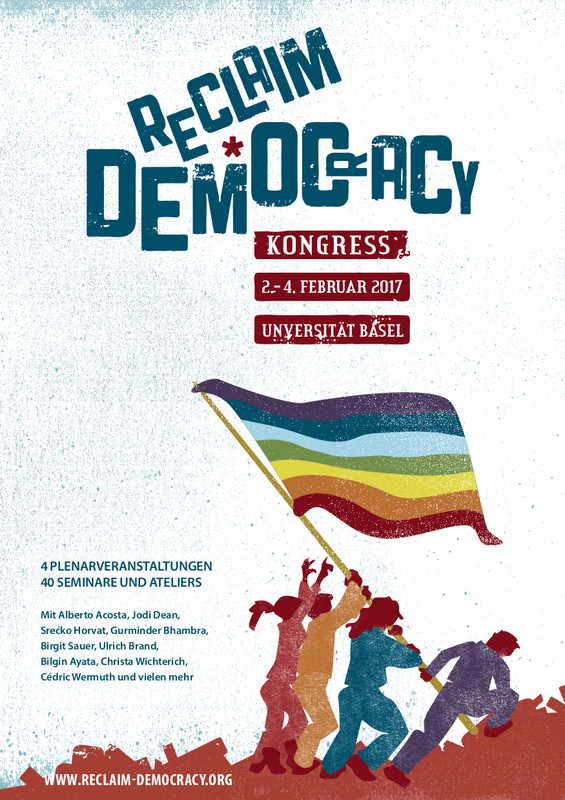 In four panel discussions and 50 “Ateliers” (various workshop formats), we will discuss how democracy and human rights can be strengthened against economic interests and against racism. 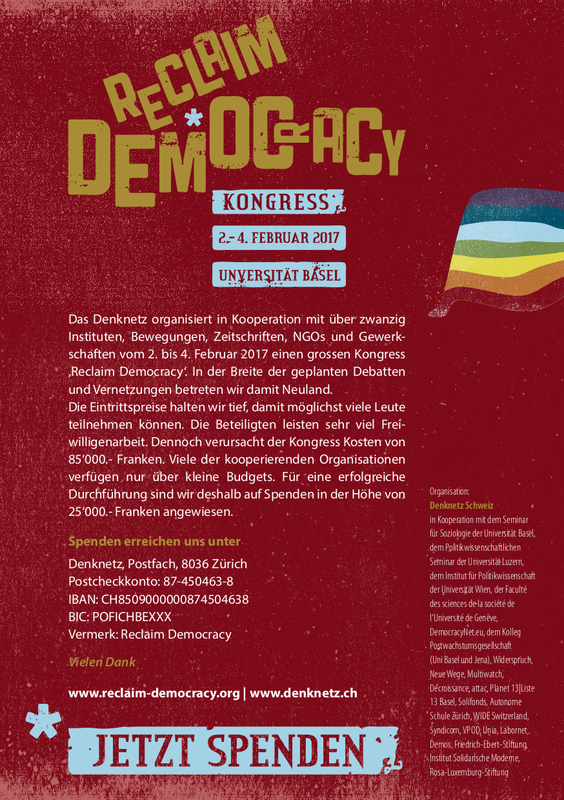 The congress is organized by Denknetz Schweiz in cooperation with the Seminar für Soziologie at the University of Basel, and 23 institutes, activist groups, NGOs, think tanks, labor unions and journals. Keynote: Alberto Acosta, economist and former Minister of Energy and Mining in Ecuador. Keynote: Srećko Horvat, Croatian philosopher, author, and coordinator of DIEM25. Keynote: Gurminder Bhambra, professor of sociology, University of Warwick, UK. Keynote: Jodi Dean, professor of political science at Hobart and William Smith Colleges in Geneva, New York. 1) Democracy must not be allowed to turn into a mere façade. How can democracy remain and become substantive? People must become part of the decisions on topics they are affected by – from how everyday life looks like, to how our democracy is organized, to how power is divided on all levels. Otherwise, democracy loses its legitimacy. 2) What is the relationship between democracy and human rights? Human rights, liberties, and peace are the result of democratic action, and at the same time its indispensable prerequisite. By dividing human rights and democracy, both will be destroyed. 3) How does democracy develop? There is no democracy without democratic commitment and active objection to authority. Protest and civil disobedience are essential to strengthening democratic relations. The world today is far from being a strong and substantive democracy. The neoliberal reconstruction of the last thirty years has blocked the democratic development of societies in many respects. Under the pressure of deregulation and privatization policies, international trade agreements and a global competition in tax cuts, the influence of democratic decisions has shrunk. Instead, global corporations and autocratic oligarchies as well as a small class of the super rich and powerful dictate the political agenda. Their special interests are sold as the interest of the general public. This reinforces global inequalities and puts pressure on the conditions many people live in. The situation of vast sections of the population has become uncertain. Many people cannot live in safety and dignity. At the same time, millions of refugees worldwide can no longer be ignored. The downside of the “success” of the global north comes to the fore. In this situation, the nationalist right propagates strength and security through the exclusion of minorities and the vulnerable, pushing their own nation and “culture” as criteria for exclusion. The right demands and encourages a return to authoritarian forms of government. The price for all of this is high: more racism, growing discrimination based on gender identity and sexual orientation, growing inequalities, the increase of slander, lies, hatred, and war. What does a substantive strengthening of democracy require? At Reclaim Democracy, we are looking for answers to currently urgent questions. The guiding principle for any society must be the good life for all, not the war of all against all, not the accumulation of capital, and not immeasurable wealth in the hands of a tiny minority. With that in mind, Reclaim Democracy addresses the following questions: How will society become more just? How can we redistribute the wealth of a few to the basic needs of all? How to organize the taxation of companies and the rich to ensure that public tasks, services and infrastructures can be financed globally in a sustainable way? How to control financial markets democratically and limit pressure caused by speculation? How can all economic sectors be oriented towards the common good? How do public authorities gain sufficient democratic control over corporations and financial institutions? And how can growth be limited by democratic means for the survival of mankind and all life on this planet? Democracy should be thought of from the perspective of people’s everyday life. From employee participation to fairly shared care work. Which strategies do we develop for Switzerland, Europe, and globally? A strong and substantive democracy as an emancipatory social project cannot stop at national borders. How can we find concise, supportive, and sustainable international concepts and solutions? How can the rights of all humans be strengthened democratically? The immense social and economic inequalities in power must be reduced. All inhabitants of the earth have the same claim and equal right to a good life. Democracy means diversity, does not discriminate against anyone and excludes no one. How do all people gain access to education that empowers participation in democratic processes? How can all people obtain social, cultural, and political rights in the places where they live – irrespective of their nationality, gender, color of their skin, or status of citizenship? What strategies are there for communities like cities, for individual states, for Europe, and globally? How can decisions in a democracy be made in a way that includes the interests of all who are affected? How can the interests of people in poorer countries be considered when decisions in richer countries are made? How can we understand ourselves as citizens of the world who share responsibility for the entire planet? Our basic assumption is that global justice and supportive developments can only be achieved in democratic processes. Only based on a strong democracy, social conditions gain legitimacy that guarantee freedom. Only by democratic means can racism, sexism, and exclusion be overcome permanently and conflicts be solved equally und productively. Only a democratic society can collectively be responsible for the environment. Democracy has no borders. An emancipatory political program leads to an open, never ending process of social learning and development. By raising and discussion the above questions, Reclaim Democracy wants to be part of this process. At the same time, some of these questions are also aimed at ourselves: How can emancipatory democratic movements and parties meet their democratic demands while achieving as much effect as possible? Let’s reclaim and further develop democracy! Denknetz is a grassroots think tank that works independent of organizations and institutions. It is supported by its 1200 members (end of 2016) from science and research, from NGOs and labor unions, from activist and critical journals. Liberty, equality, and solidarity are the guiding principles. About a hundred members are actively involved in various sections, editorial collectives, and ad-hoc-project working groups. Denknetz organizes conferences, develops concepts and proposals for reform, and publishes books and other formats of publications. Annual membership fee is CHF 100.- (CHF 40.- for people with low or non-income). Members receive all publications for free. 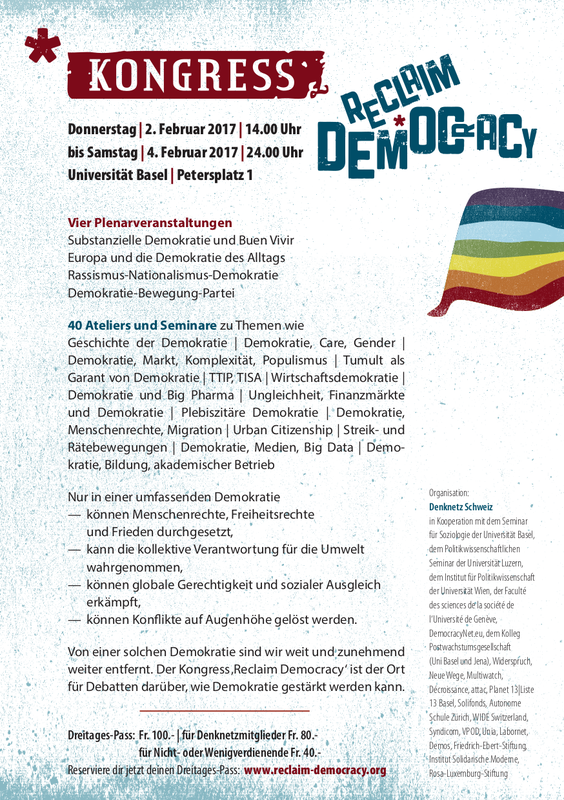 The congress will be held in German. Presentations in other languages will be translated. Please make your own reservations if you require accommodation. Affordable catering will be served at the conference.